Luis Alberto Urrea writes novels with the evocative language and lush rhythms of his poetry. 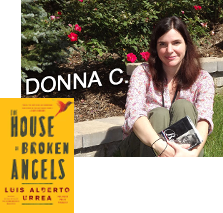 The House of Broken Angels tells the story of two days in a wonderfully complex Mexican American family, celebrating a birthday, a funeral, and a lifetime of relationships. Complementing the book, check out this NY Times interview with Urrea.